Download "Traffic Management During Construction"
1 Traffic Management During Construction The construction of Dublin Port Tunnel couldn t begin until a traffic management plan had been developed and agreed to facilitate construction of the Tunnel and to minimise disruption to people travelling along its route. The Northern Section of the Tunnel alignment runs along the centre of the M1- Motorway and N1-Swords Road (M1 & N1) for a distance of 970m, where the Tunnel was required to be constructed using the cut and cover tunnelling technique. The construction of a large trench up to 34m wide and 12m deep along the centre of the M1-Motorway & N1-Swords Road reservation, one of Ireland s busiest roads and strategically of a very high importance to Dublin City, posed the first difficult task in the overall construction of the project. The M1 & N1 consisted of a two-lane dual carriageway facilitating 32,000 vehicles per day, including bus traffic of up to one bus per minute during peak periods. The cut and cover tunnelling technique required the excavation of most of the road s reservation, leaving room for one traffic lane in each direction, to be accommodated at the top of the 12m deep cutting, which has reinforced side slopes. 2. THE REQUIREMENTS OF A TRAFFIC MANAGEMENT PLAN. 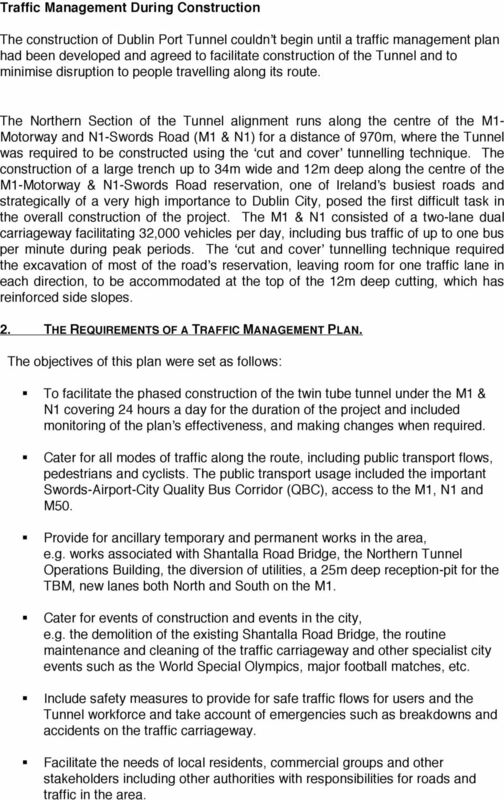 The objectives of this plan were set as follows: To facilitate the phased construction of the twin tube tunnel under the M1 & N1 covering 24 hours a day for the duration of the project and included monitoring of the plan s effectiveness, and making changes when required. Cater for all modes of traffic along the route, including public transport flows, pedestrians and cyclists. The public transport usage included the important Swords-Airport-City Quality Bus Corridor (QBC), access to the M1, N1 and M50. Provide for ancillary temporary and permanent works in the area, e.g. works associated with Shantalla Road Bridge, the Northern Tunnel Operations Building, the diversion of utilities, a 25m deep reception-pit for the TBM, new lanes both North and South on the M1. Cater for events of construction and events in the city, e.g. the demolition of the existing Shantalla Road Bridge, the routine maintenance and cleaning of the traffic carriageway and other specialist city events such as the World Special Olympics, major football matches, etc. Include safety measures to provide for safe traffic flows for users and the Tunnel workforce and take account of emergencies such as breakdowns and accidents on the traffic carriageway. Facilitate the needs of local residents, commercial groups and other stakeholders including other authorities with responsibilities for roads and traffic in the area. 2 Provide a public information campaign and the distribution of information to all those affected in particular local residents. 3. THE DETAILED DEVELOPMENT OF THE TRAFFIC MANAGEMENT PLAN. The Dublin Transportation Office Saturn model is a strategic transportation model of Dublin City s transport network and is used to assess the impact of changes to the transportation network, including private vehicle and public transport networks. In addition, the Paramics micro-simulation traffic model was developed by SiAS Transport Planners, who were commissioned by the Contractor, NMI Consortium, to assess the optimum measures that could be incorporated within the overall plan in order to minimise traffic delays. These traffic management assessment tools were used first of all to assess a do-nothing scenario, i.e., to carry out the construction works without the application of any mitigating measures. 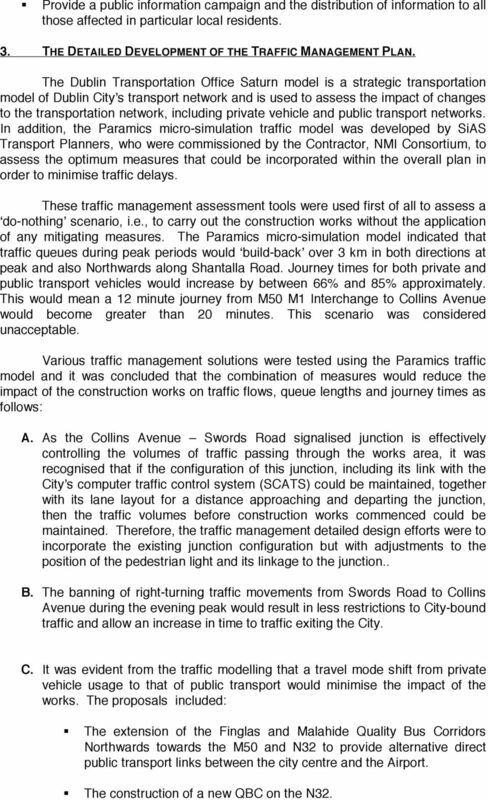 The Paramics micro-simulation model indicated that traffic queues during peak periods would build-back over 3 km in both directions at peak and also Northwards along Shantalla Road. Journey times for both private and public transport vehicles would increase by between 66% and 85% approximately. This would mean a 12 minute journey from M50 M1 Interchange to Collins Avenue would become greater than 20 minutes. This scenario was considered unacceptable. Various traffic management solutions were tested using the Paramics traffic model and it was concluded that the combination of measures would reduce the impact of the construction works on traffic flows, queue lengths and journey times as follows: A. As the Collins Avenue Swords Road signalised junction is effectively controlling the volumes of traffic passing through the works area, it was recognised that if the configuration of this junction, including its link with the City s computer traffic control system (SCATS) could be maintained, together with its lane layout for a distance approaching and departing the junction, then the traffic volumes before construction works commenced could be maintained. Therefore, the traffic management detailed design efforts were to incorporate the existing junction configuration but with adjustments to the position of the pedestrian light and its linkage to the junction.. B. The banning of right-turning traffic movements from Swords Road to Collins Avenue during the evening peak would result in less restrictions to City-bound traffic and allow an increase in time to traffic exiting the City. C. It was evident from the traffic modelling that a travel mode shift from private vehicle usage to that of public transport would minimise the impact of the works. The proposals included: The extension of the Finglas and Malahide Quality Bus Corridors Northwards towards the M50 and N32 to provide alternative direct public transport links between the city centre and the Airport. The construction of a new QBC on the N32. 4 interested groups such as local resident associations and commercial groups were held. The final plan was presented to the relevant Council Committees of Dublin City Council and their approval to proceed was obtained. 4. THE PLAN S PUBLIC INFORMATION CAMPAIGN. 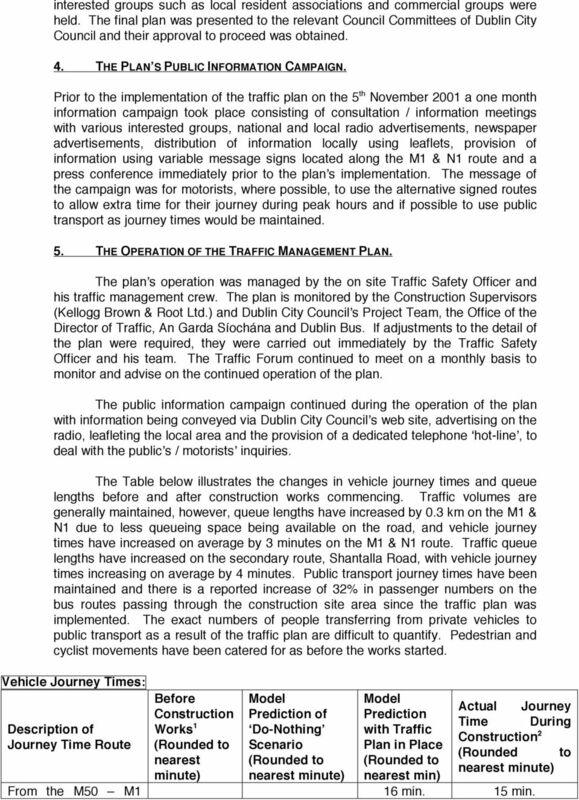 Prior to the implementation of the traffic plan on the 5 th November 2001 a one month information campaign took place consisting of consultation / information meetings with various interested groups, national and local radio advertisements, newspaper advertisements, distribution of information locally using leaflets, provision of information using variable message signs located along the M1 & N1 route and a press conference immediately prior to the plan s implementation. The message of the campaign was for motorists, where possible, to use the alternative signed routes to allow extra time for their journey during peak hours and if possible to use public transport as journey times would be maintained. 5. THE OPERATION OF THE TRAFFIC MANAGEMENT PLAN. The plan s operation was managed by the on site Traffic Safety Officer and his traffic management crew. 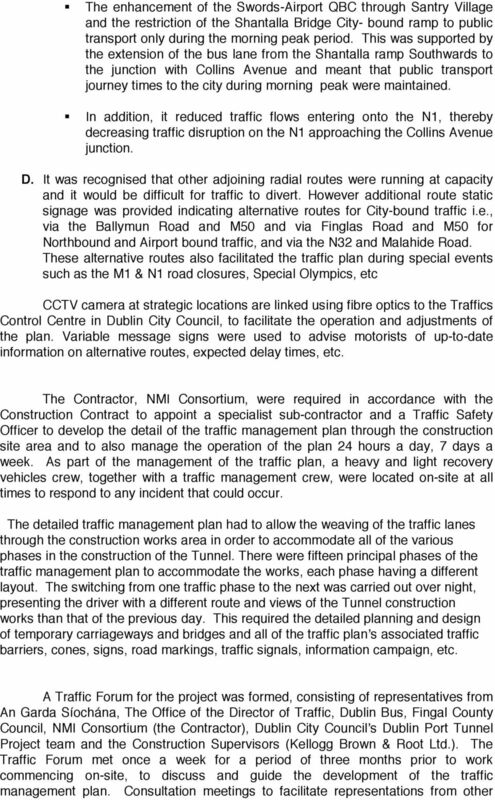 The plan is monitored by the Construction Supervisors (Kellogg Brown & Root Ltd.) and Dublin City Council s Project Team, the Office of the Director of Traffic, An Garda Síochána and Dublin Bus. If adjustments to the detail of the plan were required, they were carried out immediately by the Traffic Safety Officer and his team. The Traffic Forum continued to meet on a monthly basis to monitor and advise on the continued operation of the plan. The public information campaign continued during the operation of the plan with information being conveyed via Dublin City Council s web site, advertising on the radio, leafleting the local area and the provision of a dedicated telephone hot-line, to deal with the public s / motorists inquiries. The Table below illustrates the changes in vehicle journey times and queue lengths before and after construction works commencing. Traffic volumes are generally maintained, however, queue lengths have increased by 0.3 km on the M1 & N1 due to less queueing space being available on the road, and vehicle journey times have increased on average by 3 minutes on the M1 & N1 route. Traffic queue lengths have increased on the secondary route, Shantalla Road, with vehicle journey times increasing on average by 4 minutes. Public transport journey times have been maintained and there is a reported increase of 32% in passenger numbers on the bus routes passing through the construction site area since the traffic plan was implemented. The exact numbers of people transferring from private vehicles to public transport as a result of the traffic plan are difficult to quantify. Pedestrian and cyclist movements have been catered for as before the works started. Vehicle Journey Times: Description of Journey Time Route Before Construction Works 1 nearest minute) Prediction of Do-Nothing Scenario nearest minute) Prediction with Traffic Plan in Place nearest min) Actual Journey Time During Construction 2 nearest minute) From the M50 M1 16 min. 15 min. 5 Interchange South to Collins Avenue Swords Road Junction Along Shantalla Road from the over-bridge at the M50 to Shantalla Road Bridge. 12 min. Greater than 20 min. 13 min. (13 min. for bus) Greater than 24 min. (Greater than 24 min. for bus) 19 min. 17 min. (13 min. for bus) 1 Surveyed October Surveyed January Vehicle Queue Lengths: Description of Queue. 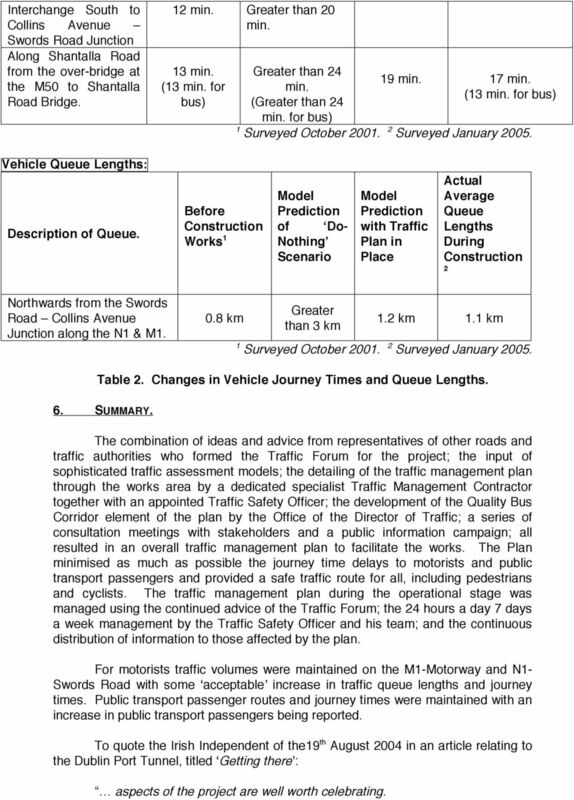 Before Construction Works 1 Prediction of Do- Nothing Scenario Prediction with Traffic Plan in Place Actual Average Queue Lengths During Construction 2 Northwards from the Swords Road Collins Avenue Junction along the N1 & M km Greater than 3 km 1.2 km 1.1 km 1 Surveyed October Surveyed January Table 2. Changes in Vehicle Journey Times and Queue Lengths. 6. SUMMARY. The combination of ideas and advice from representatives of other roads and traffic authorities who formed the Traffic Forum for the project; the input of sophisticated traffic assessment models; the detailing of the traffic management plan through the works area by a dedicated specialist Traffic Management Contractor together with an appointed Traffic Safety Officer; the development of the Quality Bus Corridor element of the plan by the Office of the Director of Traffic; a series of consultation meetings with stakeholders and a public information campaign; all resulted in an overall traffic management plan to facilitate the works. The Plan minimised as much as possible the journey time delays to motorists and public transport passengers and provided a safe traffic route for all, including pedestrians and cyclists. The traffic management plan during the operational stage was managed using the continued advice of the Traffic Forum; the 24 hours a day 7 days a week management by the Traffic Safety Officer and his team; and the continuous distribution of information to those affected by the plan. For motorists traffic volumes were maintained on the M1-Motorway and N1- Swords Road with some acceptable increase in traffic queue lengths and journey times. Public transport passenger routes and journey times were maintained with an increase in public transport passengers being reported. To quote the Irish Independent of the19 th August 2004 in an article relating to the Dublin Port Tunnel, titled Getting there : aspects of the project are well worth celebrating. 6 One of them should be a challenge for other planners. In a break with precedent, the traffic disruption on the Belfast Road has been far less than feared It can be done. Roads Task Force - Technical Note 10 What is the capacity of the road network for private motorised traffic and how has this changed over time? Workplace Transport Safety Reversing Vehicles Information Sheet What are the dangers associated with reversing vehicles? Why is reversing a problem? Triton Knoll Offshore Wind Farm Limited Electrical System Outline Traffic Management Plan October 2014 RWE Innogy UK Triton Knoll TMP Copyright 2014 RWE Innogy UK Ltd All pre-existing rights reserved. FIRST IN TRAFFIC SOLUTIONS. SWARCO GROUP PERFORMANCE PORTFOLIO. SWARCO I First in Traffic Solutions. DROMANTINE. Driving Directions. Please print or use the following guide to locate Dromantine Retreat And Conference Centre. Engagement with the community will be in accordance with Council s Community Participation Policy.